Artilda "Tilda" Anne Tidwell, daughter of Francis Marion Tidwell and Ann Gravitt, wife of Lintford Samuel Summey and John F. Summey. Artilda married Lintford Summey. After his deaths he married his brother John. Tombstone Inscription: A precious one from us has gone, A voice we loved is stilled, A place is vacant in our home which never can be filled. God in His wisdom has recalled, the boon his love had given, and though the body slumbers here, The soul is safe in heaven. Mrs. Tilda Anne Summey, widow of the late John F. Summey, passed away last Thursday November 12th at her home near Cartersville, at the age of seventy-five. She was a member of the Primitive Baptist Church and had been a resident of this section for many years. She was a native of North Carolina. The funeral was held Friday afternoon at the Macedonia church, Rev. J. T. Abernathy conducting the services. G.M. Jackson & Sons had charge of the funeral arrangements. 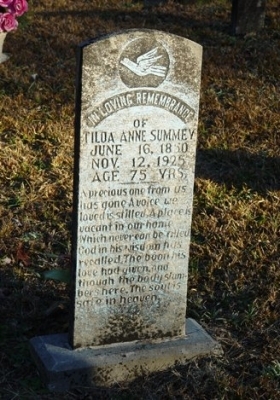 Mrs. Summey is survived by seven children, as follows: Mr. Sam Summey, of Tifton, Georgia; Mrs. Nancy Anne Hite, Willie, Dock, Kay, Elihu Summey and Mrs. Ophelia Dorsey, of Canton. On Thursday, November 12, 1925, the death angels visited the home of Mr. Kay Summey and took from their home, their loving mother, Mrs. Tilda Summey. She was a loving mother and was loved by all whom knew her. She leaves nine children, three brothers and a host of grandchildren and friends to mourn her death. She was converted in early girlhood. She joined the Primitive Baptist church and attended her meetings regular. She was ill for about a year and bore her suffering with patience. She always had a kind word for everyone. Loving hands did all that could be done, but the Lord knew best. She was a Christ working woman, and strived to help others. She was seventy-five years of age. She was married to Linford Summey, and took all the sorrows and troubles to see him laid to rest. Later she married to Johnny Summey, who died and left her alone. Cheer up sad ones, and let us all try to live such lives, so when we are called, we can meet Aunt Tilda. She is gone, but not forgotten. She was laid to rest in Macedonia Cemetery with Rev. J.T. and W.R. Abernathy officiating. NOTES: Tilda Abernathy may be a cousin to Tilda Summey. Tilda Anne was married to Linford Samuel Summey until his death. She then married his brother John F. Summey.